Good: Finds a unique angle for a heavily covered topic, comprehensive card backs, parallels are some of the best I've ever seen. Bad: Puzzle format forces collectors to build the set, artwork is occasionally squished together. The Bottom Line: 2011 Rittenhouse Archives Marvel Universe offers an in-depth look into some of the comic company's biggest events. The 90-card base set brings each event together with a nine-card puzzle filled with tons characters and varied artwork styles. Equally varied are the styles with the colored sketch cards that fall one per box. The inserts further add to the artistic theme, exploring various parts of the creation process. The big surprise for me was how impressive the acetate parallels turned out. A bit of a throwback to some of the animation cel-themed inserts of the 1990s. The nine-card puzzle has long been a part of the hobby. Generally, I like it when it's part of a card back but not quite as much for card fronts. Just like a traditional puzzle, they're no fun if pieces are missing. That said, I like the approach Rittenhouse took with this set, giving big Marvel events an over-sized canvas to work from. The 90-card set has ten different puzzles. Each is arranged with a centered around one main image with several spiraling around the outside. This makes sure every card works somewhat on its own, even though they're part of a larger picture. Card backs go in-depth into each of the major crossover events covered by the set. This is particularly appealing as several recent entertainment sets have gone the sparse route. Because the events happened over a long period of time, it's likely many collectors wouldn't have read them all. This gives them enough background to get by, while whetting appetites to maybe head out and grab a trade paperback. The inserts are led by one colored sketch card per box. With a checklist of more than 100 artists, multi-box buyers are guaranteed a variety of styles and characters. Other inserts continue the focus on artwork. They all look great with the Marvel Originals and acetate parallels standing out in particular. Given the subject matter and angle of the release, the 90-card base set finds that happy medium of being neither too big nor too small. The massive number of sketch artists may be a little too big, however because they're all of good to amazing quality, collectors should be happy with most all of their pulls. With just one hit per box, there's a lot hinging on the sketch card. If collectors aren't happy with the style or character, they will likely be less impressed with the overall set. However, those that hit something spectacular will probably have an opposite reaction. A solid mix of inserts helps add further value, but odds and checklist depth aren't anything too tough. As a result, insert should see average returns. Over the years, there has been no shortage of Marvel sets. 2011 Rittenhouse Archives Marvel Universe actually offers a new spin on the franchise. Taking big moments and giving them both an in-depth and unique look, it's refreshing. The characters aren't just the big ones (although there are plenty of them), but there are plenty of secondary heroes and villains as well. The puzzle format pretty much forces you to take a closer look at everything, and that's always a good thing. 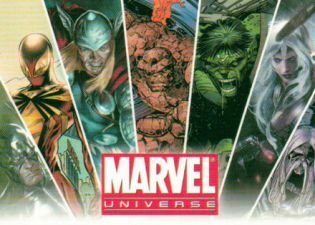 The focus of Marvel Universe from Rittenhouse Archives is on the epic crossover events that often change the comics landscape. The base set is designed around nine-card puzzles, ideal for display in pages. Every 24-pack box includes a color sketch card from one of 130 different artists. Random hot boxes have complete sketch card puzzles. 90-card base set is designed to showcase the greatest crossovers in Marvel history. The set is made up of ten different nine-card puzzles. One color sketch card in every box. Sketch card checklist includes over 130 different artists including Charles Hall, Melike Acar, Axebone, Rhiannon Owens, Eman, Frank Kadar, Meghan Hetrick-Murante, Hanie Mohd, Justin Chung, Gabe Hernandez, Mahmud Asrar, Kevin West, Newton Barbosa and Sanna Umemoto. 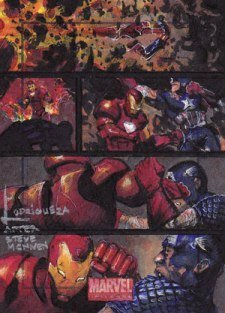 Inserts: Ultimate Heroes, Artist Drafts, Marvel Originals and a base set parallel. Total print run of 8,000 boxes. More than 200 hot boxes with complete sketch card puzzles. Custom binder includes exclusive promo card. 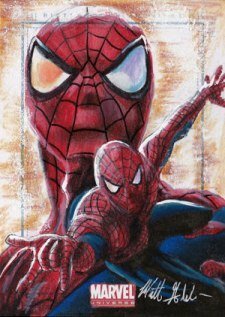 Six-Case: dual-character color sketch card by Anthony Tan. Nine-case: matching pencil, ink and color sketch cards by Jim Kyle showing the work's progress. 18-case: Archive Box with 30 random sketch cards. 2011 Topps Marvel Universe Hero Attax Collectors Card Base Set (160)--Value!